We recently discussed the NEO cryptocurrency, and I shared with you how the price of NEO surged manifolds in a short span of time. Was it just the reflection of greed and fear of such people who missed the Ethereum rally? Was it artificially pumped up due to the involvement of China? Is NEO really the “Ethereum of China”? Has NEO really solved a problem which nobody else has solved? These questions pushed me to thoroughly learn about how NEO and Ethereum were different and how they were similar. And here I am to share with you my important findings. 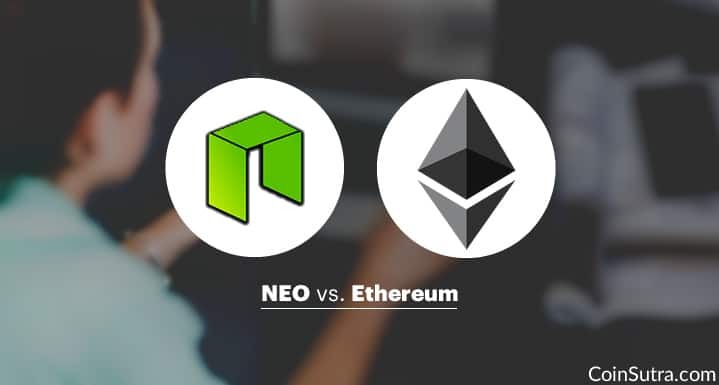 But before outlining the key differences between NEO and Ethereum, it is important to understand their similarities. How Are NEO & Ethereum Similar? NEO and Ethereum are both blockchain projects specifically designed to host smart contracts, ICOs, and DApps in a decentralized manner. Their respective blockchains are fueled by crypto-assets (GAS in NEO, Ether in Ethereum). Both the projects are open-source, Turing complete, and have ample community backing with great, responsive teams. In my opinion, these are the only key similarities. How Are NEO & Ethereum Different? When you look around the crypto-market, you will find many altcoins. But seldom will you find an Ethereum competitor and/or an alternative. I firmly believe that NEO might be a competitor and an alternative to Ethereum. NEO is backed by the Chinese government. This has become the most important factor for NEO’s popularity in China, making it China’s first open-source public blockchain project. NEO is also backed by WINGS, Alibaba, and various Microsoft-like giants. Ethereum is not backed by any nation’s government, but it is supported by the EEA-Enterprise Ethereum Alliance. This speaks volumes about its popularity and potential success on the world’s stage. NEO uses a delegated Byzantine Fault Tolerant (aka dBFT) consensus mechanism, which is an improved form of proof-of-stake. dBFT is believed to be more energy efficient than proof-of-work, as POW is a very energy-intensive and expensive. But I don’t see this as a big advantage for NEO because we can eventually expect Ethereum to move to an efficient proof-of-stake mechanism. The native crypto-fuel of NEO’s blockchain is not divisible. It only exists in whole numbers (1,2,50,1000, etc.). NEO produces a special crypto asset called NeoGAS (or GAS) which is used as a crypto-fuel for NEO’s blockchain. In Ethereum, small units of Ether are used as “gas” to fuel the network. NEO’s smart contracts and DApps can be written and compiled in C# and Java. In the future, developers will also be able to write smart contracts in Python and Go. This will drastically reduce the entry barrier for all developers around the world. Currently, if you want to write smart contracts and DApps on Ethereum, then you have to learn a new programming language called Solidity. Very few people know this language. NEO is focused on making a smart economy by digitizing traditional real-world assets via digital identity, along with running smart contracts and DApps. Ethereum is going in the direction of becoming the world’s only supercomputer based on the blockchain by hosting numerous use cases of digital identity, computing, decentralized exchanges, remittances, and KYC (to name a few). There isn’t much information available about NEO for the English-reading audience due to its Chinese roots. Ethereum is already a global enterprise which fully caters to its international (and English-reading) audience. At present, NEO can handle 10,000 transactions per second. Ethereum can handle 15 transactions per second. This is currently NEO’s biggest advantage in my opinion, but I think Ethereum will solve this soon as they are actively working on scalability. NEO is quantum computer-proof. Quantum computers are believed to have the ability to break into and hack the cryptographic math on which blockchains are based. NEO claims that they have already developed an anti-quantum cryptography mechanism called NeoQS (detailed in their white paper). Ethereum and every other cryptocurrency is not quantum computer-proof. NEO vs. Ethereum: Who will win? Well, no one really knows what the future will hold. Though NEO has said they are positioning themselves to be in direct competition with Ethereum, I still think that there is a long way to go for them in terms of mainstream adoption. This is not speculative investment advice; it’s a fact that Ethereum is well-positioned in the crypto market, especially when it comes to their technological aspects. But again, no one knows what the future will hold. Both projects are relatively new (in the grand scheme of things), and they both need to deliver on their core promises. When those things start to happen, we’ll have a clearer picture of which one will come out on top. That’s all from my side in this article on the differences and similarities between NEO and Ethereum. What do you think about NEO and Ethereum? Which one do you like better? Which one do you think has a brighter future? Let me hear your thoughts in the comments below! And if you like this post, do share it with your friends on Facebook and Twitter! 1 How Are NEO & Ethereum Similar? 2 How Are NEO & Ethereum Different? 2.1 NEO vs. Ethereum: Who will win? Read that IOTA is cryptographically weak and is ot purely blockchain. IOTA is NOT on a blockchain at all, It’s called a tangle. Can’t comment on Price but it is here to stay and has a strong usecase. Can you produce a citation for the Chinese government supporting NEO?